Weddings are an important and a joyous occasion for the newlyweds, but it is also an event which can cost a fortune for those who are organizing the wedding ceremonies and festivities. It is thus important (and a good idea as well) to budget your expenses for coordinating the necessary arrangements for the newlywed couple and the guests, so that you don’t end up spending a fortune. 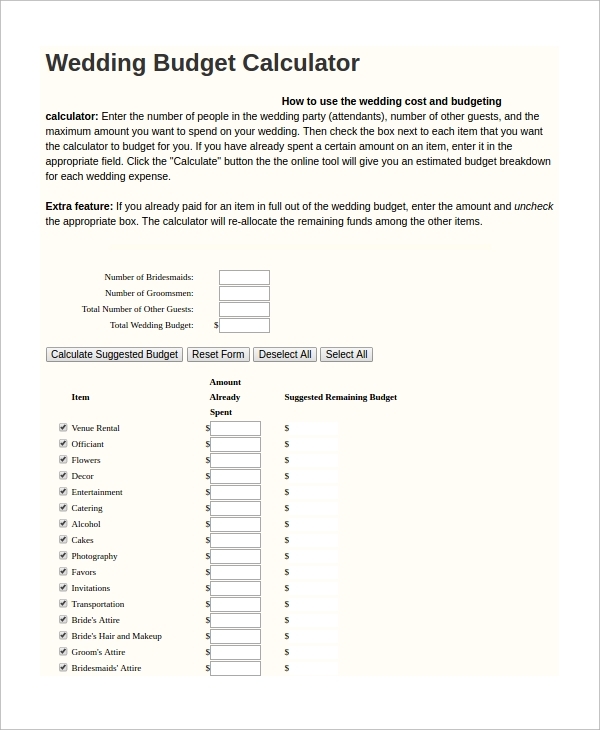 The following is a list of sample wedding Budget Calculators. Flowers are an important decorative item for any wedding celebration. They include the flowers in the bride’s bouquet to the flowers used for decorating the wedding hall. 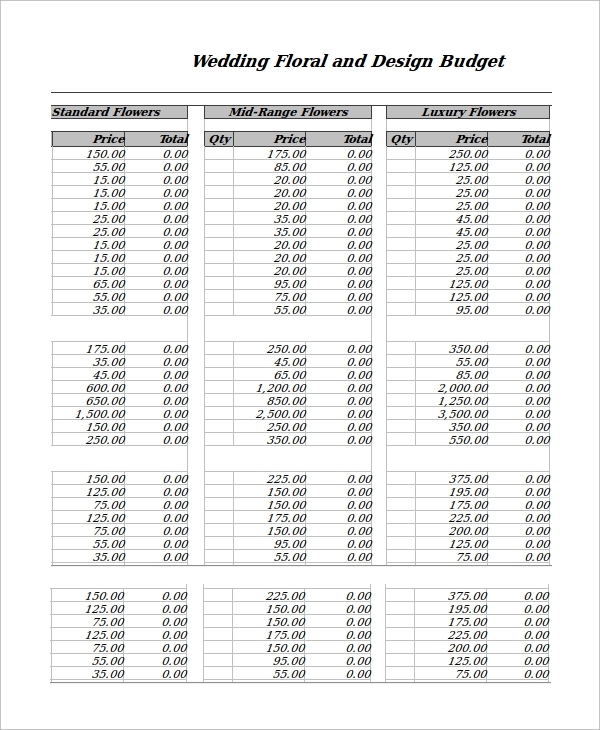 An estimate of the costs of the flowers that will be used can be calculated using this template. A wedding ring is the most important component of the entire wedding celebrations. It symbolizes the marriage between the bride and the groom and it thus acts as a metaphor for the entire wedding itself. An excellent wedding ring should not only be beautiful but should also be within one’s means and this template calculates the expenses for procuring one. Floral decorations are an important way to aesthetically attract the organizers and the guests to partake in the wedding celebrations. It is a nice way to make the wedding venues beautiful and charming to the eye and to the heart. 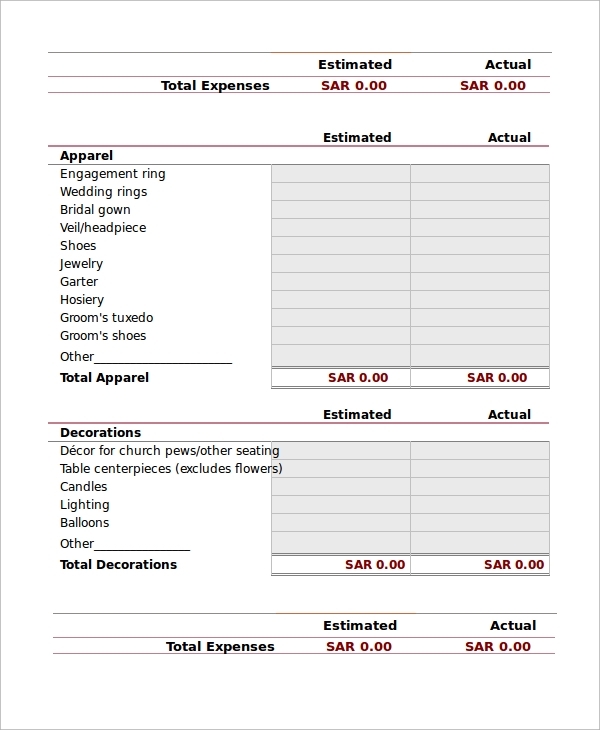 This template helps in calculating the estimated expenses that will be incurred in getting the floral decorations. Planning and executing the various events and ceremonies of a wedding would also include the consideration of the cost and expenses such arrangement would incur for the organizers. It is important to plan accordingly and make judicious use of the resources at your disposal. 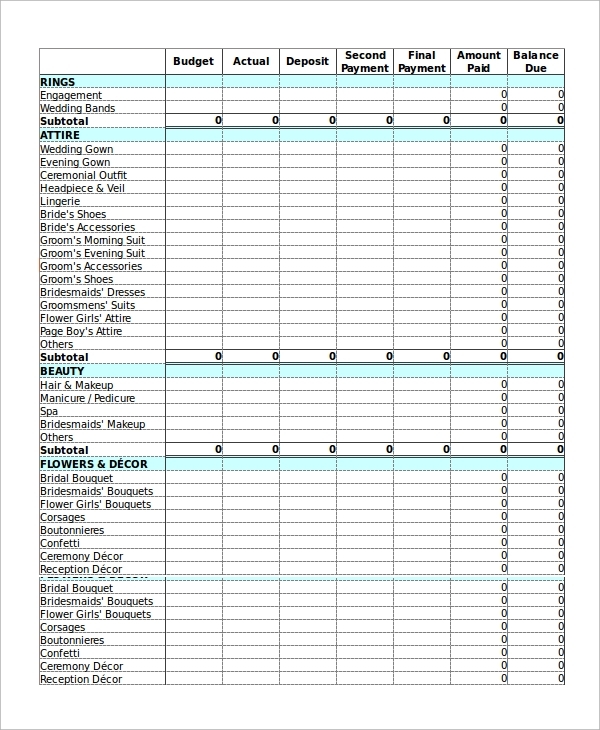 This template would enable you to not only plan your wedding but also help you estimate the expenses that might be involved. You can also see the Sample Time Card Calculators. Allocation of the monetary resources is an important trait of being frugal and economical, and weddings are no exception. One has to identify the priorities and allocate the required budget accordingly considering what events or ceremonies would be indispensible for the wedding. This template helps you to allocate the expenses efficiently. You can also see the Inflation Calculators. 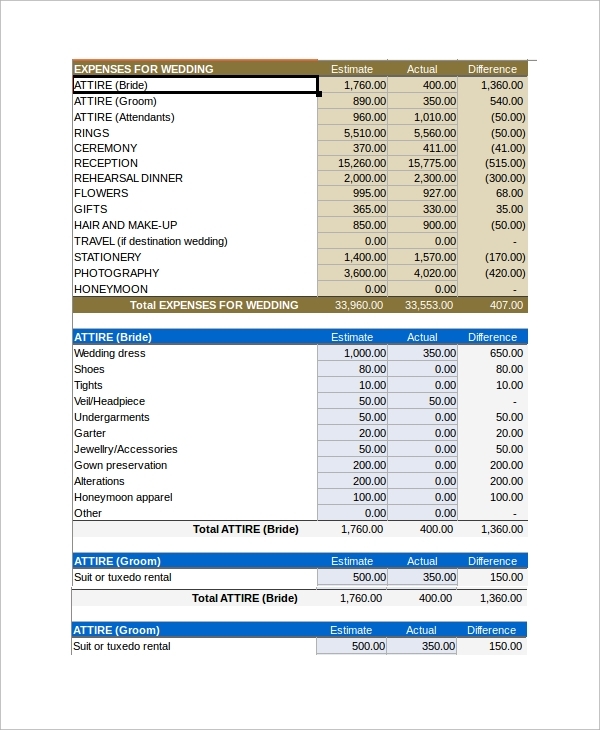 As already stated, the above list of Wedding Budget Calculator Samples is useful for determining an estimate of the costs and expenses that will be involved in organizing the wedding celebrations. It is helpful to have an estimated list of expenditure that can be compared to the actual expenses, helping to determine where the expenses have gone too high or where the expenditure has been under the reins of the budget. Sample wedding budget calculator templates are useful for anybody who might be considering to organize a wedding but at the same time want to keep the expenses within the confines of their proposed budget. 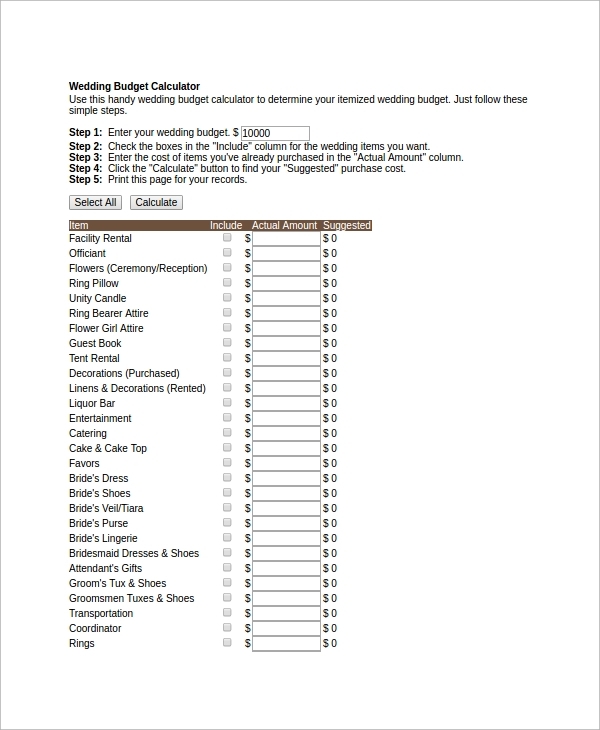 We have an extensive collection of sample wedding budget calculators in spreadsheet formats which are completely editable. 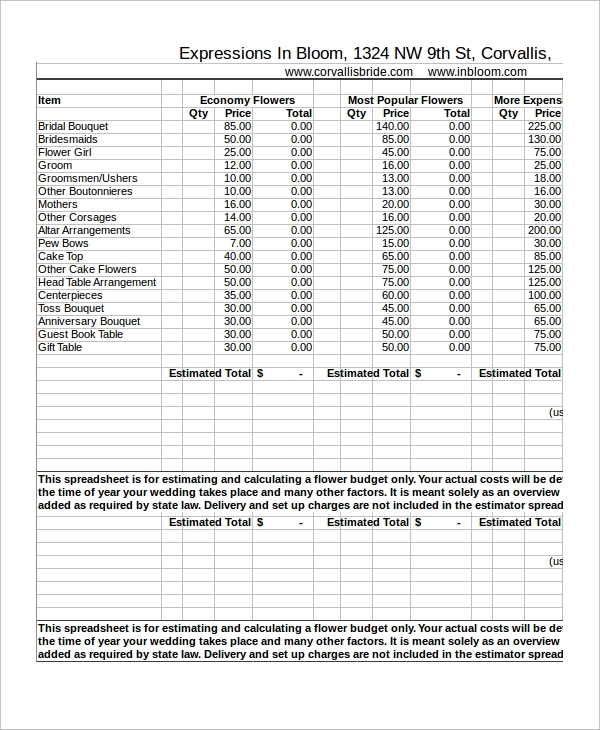 You may also use these samples as a guide to make your wedding budget calculator. You can also see the Timesheet Calculators.